Fast Track Cycling, a non-profit organization dedicated to develop, promote, and sustain the operations of an Indoor Velodrome and Multi-Sports park in Cleveland, is throwing a party and raffling of a track frame hand-built by Cleveland's own Cicli Polito. The party will take place Wednesday, June 24th at Brothers Lounge, 11609 Detroit Ave (W. 117th & Detroit) from 4:00pm to 8:00pm, with the drawing for the frame at 7:00pm; complimentary food and a cash bar. Raffle tickets are $20 per ticket or 6 for $100, with all proceeds going toward Fast Track Cycling's efforts to construct a indoor velodrome in the Greater Cleveland Area. Cicli Polito recently won best of show at the North American Handmade Bicycle Show, in Indianapolis, Indiana. Here's your chance to get an award-winning frame while helping a good cause. Win-win if I've ever heard one. Nice to see you posting John! A subject truly near and dear to my heart as well. 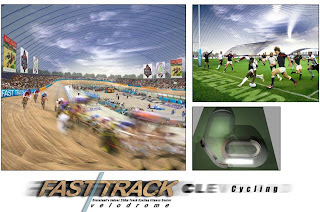 I really dig the thought of a velodrome in C-town, I'd be inclined to knock off a few laps myself...wanna race? Count me in for a race. I'll ride the Crosscheck, you the Fuji. Fenders stay on!